In my previous demography post, I argued that for all intents and purposes, Russia’s “demographic crisis” can be reasonably argued to have ended. Population growth is now consistently positive since 2009, and as of last year, the country’s natural decrease was a mere 131,000. 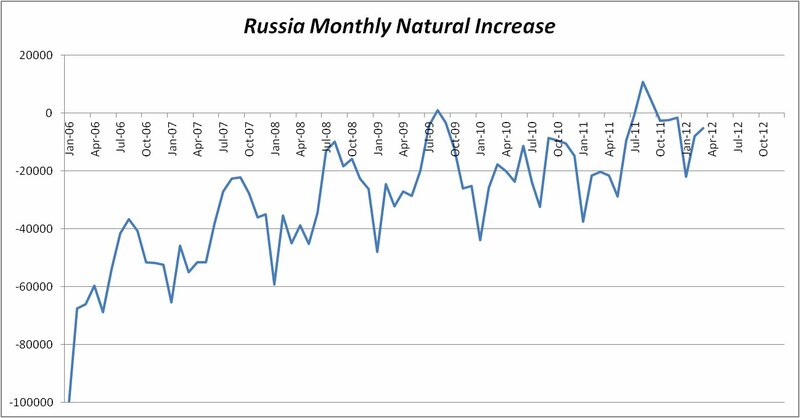 This is a massive improvement over the 500,000-1,000,000 annual natural decrease seen in 1993-2006. The latest figures continue to beat all expectations (even my relatively optimistic ones) in the first three months of this year. The crude birth rate has risen by 6.5% over the same period last year, implying a c.8% rise in the total fertility rate (slightly higher since the ratio of women of childbearing age is now falling). Projecting it for the rest of the year – a risky assumption, granted, but this is back of the envelope stuff anyway – would give a TFR of about 1.73 for 2012 (from c.1.60 in 2011). This would make it broadly comparable to the Netherlands (1.79), Iran (1.70), Canada (1.67), and Estonia (1.62); below the US, France, the UK, and Scandinavia (1.8-2.0); and above Germany, the Med, Japan, South Korea, Poland, China, and the Christian ex-USSR (1.2-1.5). It is time to stop thinking of Russia as a low-fertility country; it is firmly in the middle of the pack among industrialized countries. It is particularly noteworthy that whereas Russia is frequently described as the sick man of the BRIC’s (in demographic terms), it is now probably closer to Brazil (1.86) than it is to China (c.1.4-1.5). 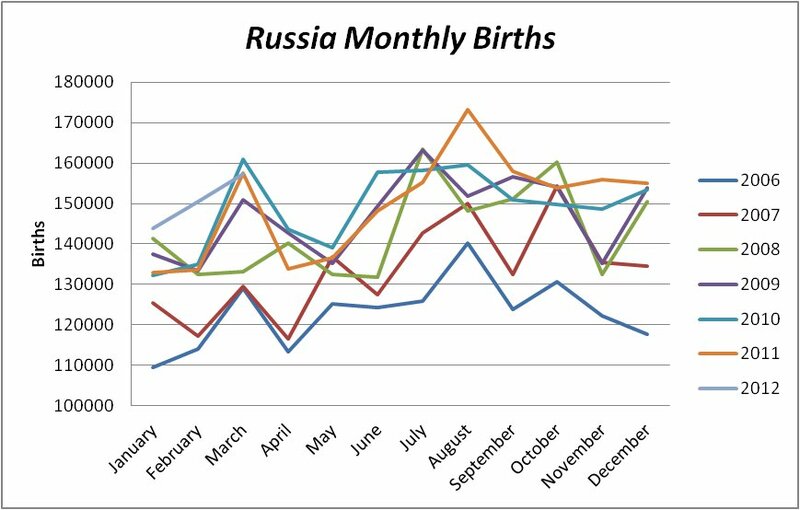 January and February were both record-breaking months for post-Soviet births, continuing on from record birth numbers in August-September and November-December in 2011. 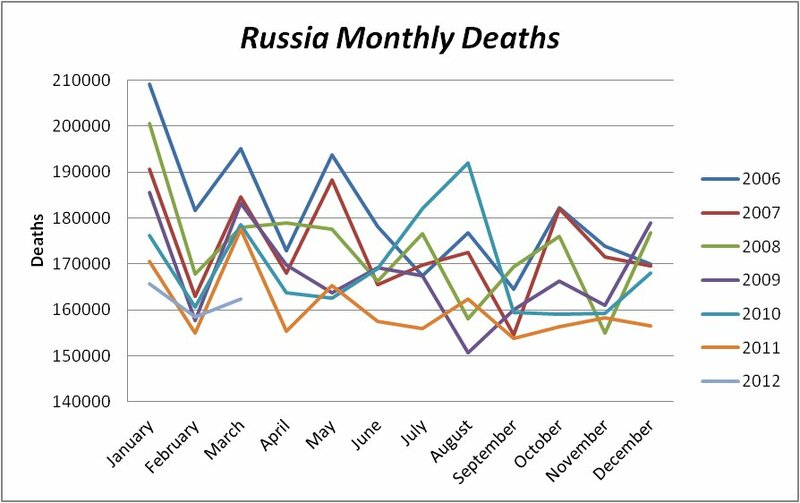 Monthly deaths have also set new records this year for both January and March, following on from remarkable improvements throughout 2011 as a whole – when new records were the rule rather than the exception. 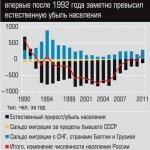 As you can see above, Russia’s natural population growth was essentially stable for the second half of 2011. 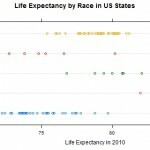 If current trends continue, there may be significant natural population increase in the second half of 2012. 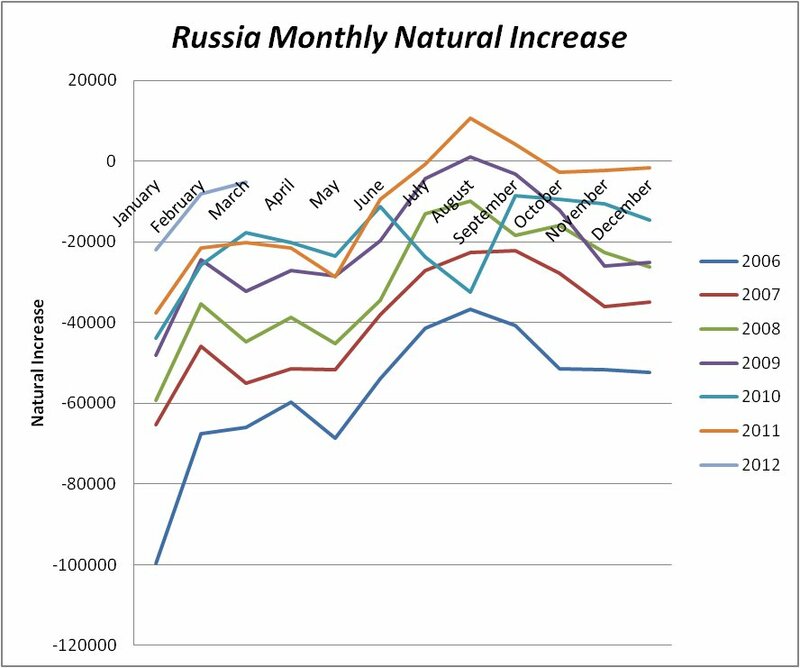 For more of these graphs stretching to 2002, see the old post by Sergey Slobodyan on this blog: Russia’s Demographic Resilience II. Needless to say, overall population growth is absolutely certain, because of immigration (which increased to 320,000 last year). Above is a long time graph of births and deaths by months from 2006 to today. A linear extrapolation (very crude) will see the two cross sometime in mid-2012. Here is a graph of population natural increase. The pattern again is clear; it has virtually edged up to zero. The structure of deaths is also moving in a highly encouraging direction, with improvements in “deaths from vices” (suicide, homicide, alcohol poisoning) being the most notable. That is good because these deaths accrue to younger people, so the positive impact on life expectancy (not to mention their especially tragic nature) is particularly strong. In the first three months, deaths from alcohol poisoning fell by 23% (so they are now as low as during the height of Gorbachev’s anti-alcoholism campaign), homicides fell by 10%, and suicides fell by 5% (and are now lower than they’ve ever been since at least 1970). The only downside was a 3% increase in deaths from transport accidents, but this is presumably a function of more vehicle ownership given the improvements in other areas. A potentially serious development, but one that isn’t, is an increase in the infant mortality rate from 7.1/1000 to 8.4/1000 in the first three months of this year relative to the same period last year. 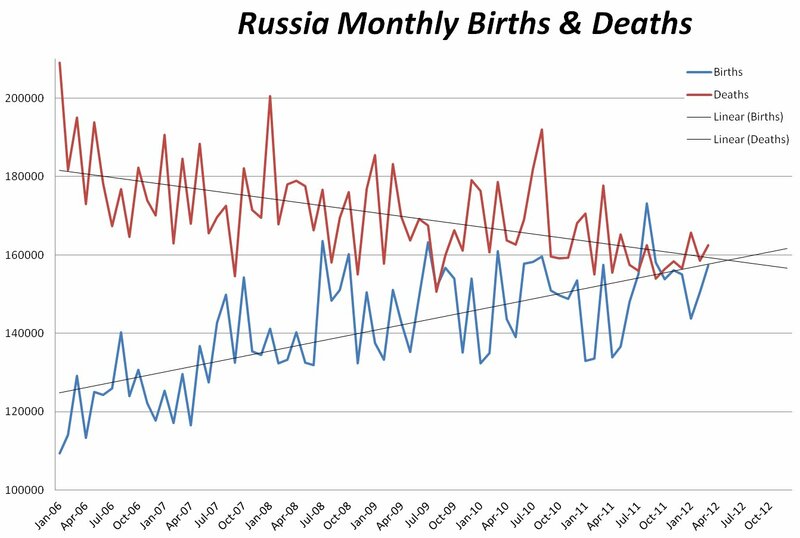 That is because this year Russia switched to the WHO definition of infant mortality as the share of life births, as opposed to the old system that excluded very premature babies for the first 7 days of their lives from the statistics. The old system underestimated the infant mortality rate by 22%-25%, so an 18% increase now is actually a modest improvement in real terms. Some conclusions and predictions to round off the post. Russia should no longer be considered a low-fertility country (by industrialized world standards), though it is still a high-mortality one. This year, 2012, will see further improvements, with life expectancy rising to about 71.0-71.5 (barring a repeat of 2010’s monster heatwave or other environmental cataclysm); TFR rising to around 1.70; close to zero natural population growth (though probably still slightly negative, maybe -50,000); and substantial overall population growth once immigration is accounted for. The Western media will continue shrieking about the Dying Bear and variations thereof.